Hence the Email Addiction report. During many years of helping Brands with their email strategy, we have found that knowing how your customers interact and perceive your emails is key for successful email marketing. The survey asks some questions that have never been addressed before, uncovering how consumers use email and think about email marketing. We all want to know the views and behaviors of consumers that have the greatest impact on email marketing. What are the most attractive reasons for people to sign-up for newsletters? How do consumers feel about no-reply addresses? What is the desired frequency for brands to send offers? How easy is it to read emails on mobile? What do people expect to get after they sign up for a newsletter? There is little you can assume about the context of the reader. In the bathroom, on vacation, in restaurants, regardless of where more than a third are checking their email. 77% turn to email in a moment of boredom. 70% check their email in bed and almost equally as many immediately when waking up. Why don’t customers unsubscribe from brand emails they opted-in for but mostly ignore? The majority says it’s not because they’re no longer engaged in the brand. They are either waiting for the right offer (37%) or because they expect to buy from the brand again. (24%). What are the innovations in email marketing that consumers are interested in? 38% wants emails to include product ratings and 35% offers based on their past purchases. Consumers are looking for qualification and relevance to help the decision to click. Surprisingly the enthusiasm for location based email is high with 31% seemingly no big concern of brands being too intrusive. 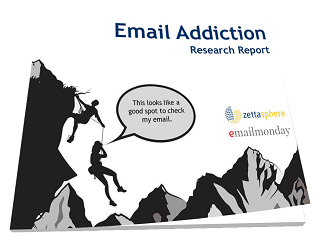 The report was compiled by email marketing consultants Tim Watson of Zettasphere and Jordie van Rijn of Emailmonday. The statistics are based on a survey of 417 predominately North American consumers sampled at random and representing all demographics. Feel free to get in touch with questions about the research. Please quote and use the research findings/report graphics freely, as long as you include proper attribution and link to this page. Thank you.